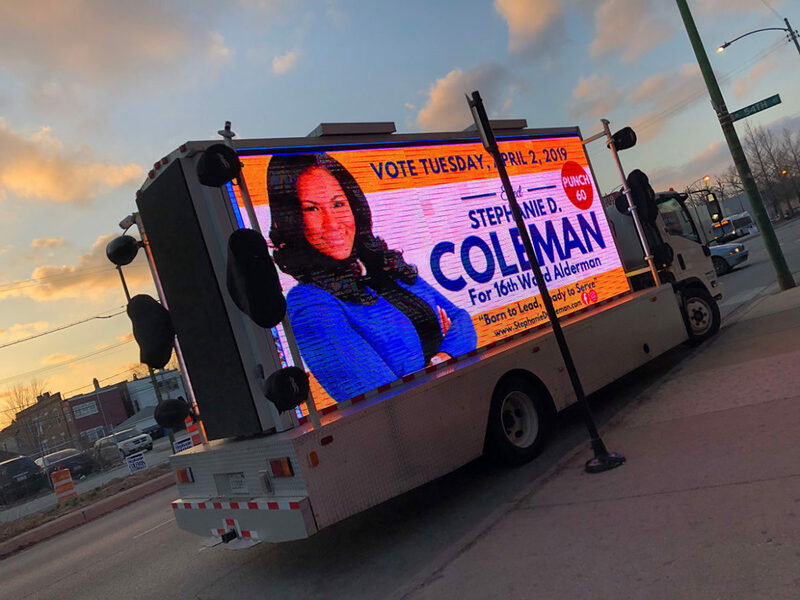 A electronic billboard on a flatbed truck sits near Stephanie Coleman’s campaign office near Ashland Avenue and West 54th Street on Election Day. 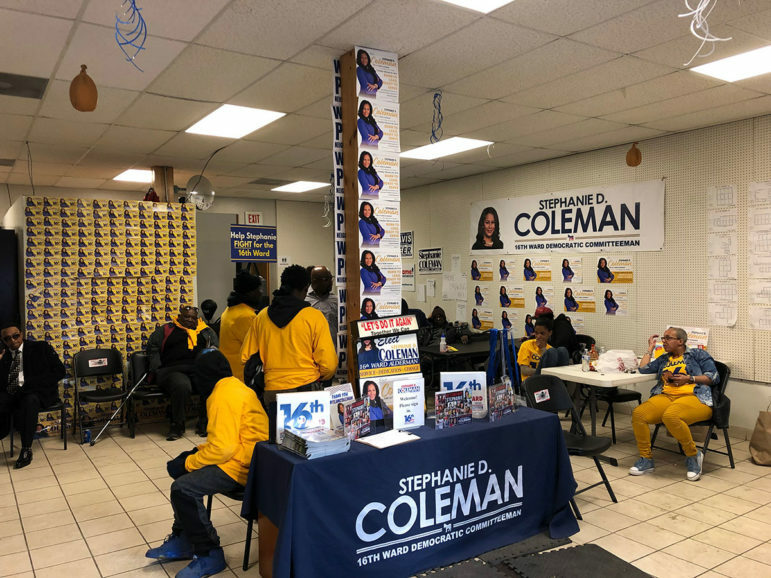 Stephanie Coleman, the daughter of the longtime former alderman of the 16th Ward who brazenly ran on a campaign slogan of “born to lead,” handily defeated incumbent opponent Ald. Toni Foulkes in a runoff election last Tuesday, April 2. Coleman won with 66 percent of the vote with all precincts reporting in unofficial results. Amid a historic open mayor’s election and the intrigue of City Council scandals, the 16th Ward drew little ink and stayed in the shadows over the course of a bitterly fought campaign that featured a rematch of the two opponents from 2015. But the awkwardly and heavily gerrymandered slice of city real estate that is the only ward that sits wholly within the storied South Side neighborhood of Englewood offers a glimpse of modern Chicago politics—a unique blend of how things have changed, dysfunction, and, depending on which candidate you ask, typical corruption or incompetence. Coleman is the 16th Ward committeeman and daughter of longtime former Ald. Shirley Coleman, who represented the ward from 1991 to 2007. Foulkes says she is a former organizer and Jewel-Osco cake decorator who narrowly won election by just 143 votes over Coleman in 2015. The rematch was different than the 2015 race in a few ways. For one, Coleman says she learned from her 2015 loss and emphasized knocking doors and meeting as many voters as possible. She also honed a message focused on core quality of life issues, such as making sure city officials are responsive to ward needs. Another difference: Coleman became the area’s ward committeeman in 2016, an elected position in the Democratic Party with a job to register voters and encourage them to head to the polls. Once a standard bearer for the party with considerable clout, the position has significantly changed over the years. Mike Fourcher, the former publisher of the political site The Daily Line who is now public affairs manager for the lobbying firm Reyes Kurson, said being a committeeman, for Coleman and anyone else, isn’t the advantage it used to be. Committeemen saw their heyday when former Mayor Richard M. Daley was rising to power in the ‘70s. Then, committeemen turned out the vote by doling out politically-connected jobs—known as patronage. Even Foulkes, the ward’s former committeeman who lost the race for the spot to Coleman in 2016, said she didn’t take that election seriously. There might be some financial advantage to the committeeman’s position. Ward committeemen who were also running for alderman this year raised nearly $170,000 on average through their ward committees as of the February 26 election, a Reporter analysis of state campaign filings found. For those who chose to raise money through a separate fundraising account for their ward committee, that money constituted about one-quarter of their total fundraising this cycle. Thirty-one of the 50 ward commiteemen are also incumbent members of Chicago’s City Council. Twenty retained their seats outright in the February election, while eight other races were decided in last week’s runoff, including Coleman’s. Along with Coleman, three of those committeemen (all incumbent aldermen) won their runoffs, according to unofficial results: Ald. Raymond Lopez (15th), Howard Brookins (21st) and Ariel Reboyras (30th). Two runoffs of incumbent aldermen who are also committeemen, one featuring Ald. Roderick Sawyer (6th) and the other Ald. Leslie Hairston (5th), were still being disputed as vote tallying continued in the close contests. Longtime Committeeman and 40th Ward Ald. Patrick O’Connor was unexpectedly unseated in Tuesday’s runoff election, and Ald. and Committeman Robert Murphy (39th) also lost his seat. Ward 22 Committeeman Michael Rodriguez ran for an open seat in the ward and won with 64 percent of the vote. Three aldermen who are committeemen lost outright on February 26: Joe Moreno (1st Ward), John Arena (45th Ward) and Joe Moore (49th Ward). 20th Ward Committeman Kevin Bailey failed to make the runoff for an open seat in his ward. Even with a new political reality, questions surrounding patronage often abound in Chicago politics. 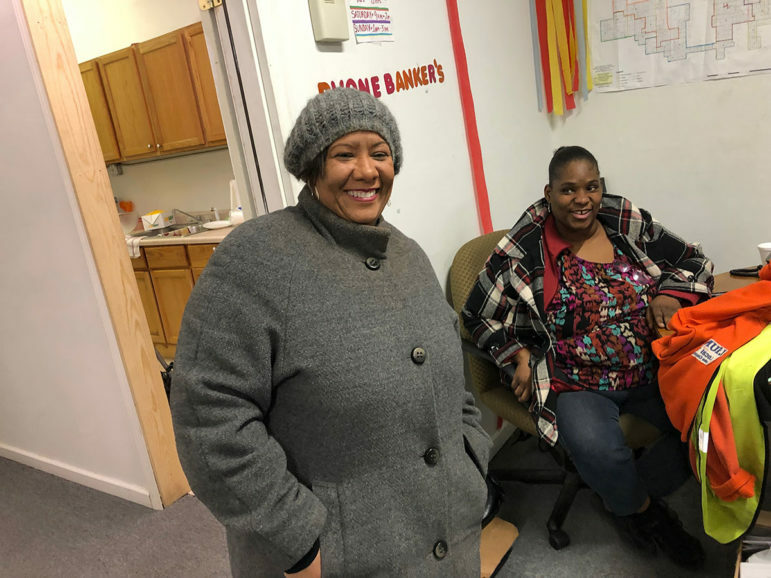 And Coleman’s job working for Cook County—allegedly connected to her role as ward committeeman —should raise eyebrows, Foulkes said in an interview. Volunteers for Stephanie Coleman await runoff results at her campaign office headquarters on election night. Foulkes said that the series of events that led to Coleman being added to the Cook County payroll are suspicious. Coleman was one of the committeemen who considered placing Cook County Commissioner Dennis Deer in office after the June 2017 death of his predecessor, Robert Steele of Cook County’s Second District, which overlaps with part of Coleman’s ward. Endorsing party candidates and filling vacant seats is a primary responsibility and perk of the elected committeeman’s role in the Democratic Party. Less than two months after Cook County committeemen put Deer in the vacant position, Coleman was hired to work for Deer as an aide in September 2017, according to a county spokesperson and a Daily Line story that chronicled Deer’s endorsement for the Cook County seat. Becky Schlikerman, a county spokesperson, said that Coleman was hired as an aide to the commissioner on Sept. 5, 2017, and resigned on Jan. 4, 2019. Payroll records indicate Coleman made about $10,000 per quarter or about $40,000 per year in the job. Deer did not respond to email requests for comment. After an initial interview about her campaign, Coleman and a campaign spokesperson didn’t respond to questions by the Reporter. A campaign volunteer, Dedrick Rent, said he could answer questions for the campaign on election night. Rent said he wasn’t aware of how Coleman got her district job. That said, Rent, who according to state campaign filings is the chairman of Coleman’s fundraising committee, was familiar with the 2017 events: Coleman had backed him for the role. Rent didn’t make it to the latter stages of the interview process as the Second District’s commissioner. He said Coleman would quickly respond to questions; as of Monday, she had not done so despite repeated requests to Rent and by email to her and a campaign spokeswoman. Rent said Coleman has the right to pick who she wants for a Democratic Party vacancy. “She has an obligation to interview and pick who she thinks is the most qualified,” he said. Jacob Kaplan, executive director of the Cook County Democratic Party, said in a text message that he believed the vote to put Deer into the slot was unanimous among committeemen. There are no minutes or official record of the meeting, he said. Coleman is one of just three committeemen who have been on the city or county payroll recently, a Reporter review of online payroll databases found. The others are Michael Rodriguez (22nd Ward), the executive officer of Cook County Hospital, and Aaron Goldstein (33rd Ward), a public defender. But it was clear that one of the big reasons Coleman won on Tuesday isn’t completely because of any classic, Chicago-style maneuvering. Coleman’s campaign signs were everywhere throughout the ward, as were a noticeable presence of volunteers. Outside of her campaign office on Tuesday, a flatbed truck with a massive electronic billboard idled after a long day cruising the ward. In February, Coleman’s role as committeeman didn’t seem to help turnout. A committeeman’s primary responsibility aside from endorsing candidates for the Democratic Party is to push voters to register and come out to the polls. But few in the 16th Ward did so in the February 26 election, just 23 percent of registered voters—the lowest of all 50 wards, according to the Chicago Board of Elections. Coleman said in a previous interview in her bustling campaign office that since her loss in 2015, she has become a better student of campaigning. She has worked to target voters who go to the polls more often and stayed focused on a message of delivering constituent services. Coleman said the area has suffered from Foulkes’ lack of leadership, and residents are eager to turn the page on her term. Chicago redrew its ward lines in 2015 as part of redistricting, which means Foulkes’ tenure has shifted across ward boundaries. The hacking apart of Englewood into oddly-shaped wards through redistricting has contributed to the neighborhood’s diminished political clout, the South Side Weekly explored in a recent series. Coleman recounted seniors telling her that they couldn’t get city officials to place new garbage cans despite calls to Foulkes’ office. Other residents interviewed on Election Day also expressed a frustration with receiving basic city services in the ward. Coleman made those kinds of constituent services a focus of her campaign. Sixteenth Ward Ald. Toni Foulkes visits her campaign office on Election Day before runoff results were announced. Foulkes, for her part, said the job isn’t what it looks like from the outside. Asked about her votes to fund a new police academy, or in support of police settlements, unpopular with progressive groups, she said it’s easy for protesters to cast blame. Those making decisions have to consider all sides, she said. She said part of her appeal is that things are going well in Englewood, and she understands the job better than she has in the past. “My schools are good. The crime rate in Englewood is … down. So I’m sitting at the top of my game.” Englewood has seen an increase in its homicide rate but a decrease in shootings between 2016 and 2017, according to the University of Chicago. Last year, South Side high school parents expressed outrage at the city’s plans to shutter four high schools. Several voters, among the few that could be found in February entering from the cold on Election Day in the 16th Ward, recounted familiar themes when asked about their concerns for the ward: poor schools, poor city services, fear for their safety and a lack of opportunity for young people, they said. “I’ve been in Englewood my whole life and it’s never been worse,” said David Wiley, who was shuffling out the door at Englewood Police Station on 63rd Street after voting, although he didn’t want to say for whom. Fourcher, the spokesperson for the strategy and government relations firm that includes The Roosevelt Group, said he doesn’t understand why someone would want to run for committeeman, with the exception of some of the longer standing politicians who have consolidated clout. The Roosevelt Group gave a $1,500 donation to Coleman because the group’s president has known both Stephanie and Shirley Coleman for a long time, Fourcher said. Coleman may have name recognition from her mother and the title of committeeman. But whether the “machine” could help her or anyone else—Fourcher isn’t so sure. Jonah Newman contributed to this story. Jeremy Borden is an independent political journalist. Follow him on Twitter @Jeremy_Borden or email borden.jeremy@gmail.com. The outgoing mayor’s agenda to advance Lincoln Yards, the 78, and a new police academy shows no break with his record of ignoring community and ethical concerns to subsidize gentrification.